KJIPUKTUK (Halifax) – As the saying goes, the poor get poorer, and this is definitely the case for people on income assistance. In 2019 all income assistance recipients in Nova Scotia stand to lose a good chunk of buying power to inflation. Even in 2020, when people on income assistance finally get a raise, that raise in most cases gets eaten up by inflation, and then some. Meanwhile, the department spent millions less on its Employment Support and Income Assistance (ESIA) program than it anticipated in the beginning of the fiscal year 2019-20. In other words, it saved money. 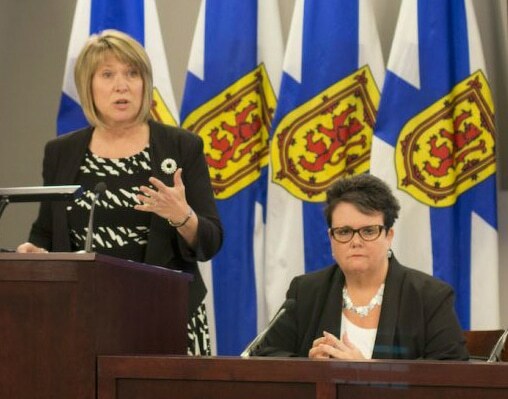 In 2015 then Minister of Community Services Joanne Bernard said that yes, things are tough for people on income assistance, but there is light at the end of the tunnel. Minister Kelly Regan and former Minister Joanne Bernard. “We are working on benefit reform to make sure we look at the longer term. We know that incremental changes, $2 here and $5 there, does not make a substantial difference in the lives of people,” Bernard told the CBC. Kelly Regan, who replaced Bernard when she was defeated in the last election, has often said the same thing. Well, this is the fiscal year that welfare reform has finally arrived. In January 2020 assistance recipients with disabilities will get a 5% increase in benefits, others will see a 2% increase. That sounds a lot better than it is. Turns out there is another tunnel at the end of the tunnel. What Calderhead found is that when you take into account inflation most people on Income Assistance will have less purchasing power, even after they finally receive that raise the department has been talking about since 2014. In calendar year 2019 all income assistance recipients take a hit. Everything gets more expensive, but there will be no raise. In other words, in terms of buying power, you’ll be poorer. When you adjust for inflation a single adult without disabilities will receive $9.57 per month less in December 2019 than he or she received in December 2018. Similarly, a single adult with disabilities will lose $13.09 per month. A single parent with a two-year old stands to lose $13.85 per month. And the damage is $19.83 monthly for a couple with two children. It’s what inflation will do to purchasing power. As anybody on income assistance will tell you, those amounts aren’t trivial when you live way below the poverty line. Note that all calculations include applicable tax credits, such as the Poverty Reduction Credit, Affordable Living Tax Credit, and the Nova Scotia Child Benefit. So in January 2020 people on income assistance receive that long- awaited raise. Surely that will improve things. Not for most recipients, unfortunately. As in 2019, here too inflation does its damage, and people end up poorer in terms of buying power when all is said and done. That 2% or $11 raise for single person without disabilities? When you correct for inflation, it’s gone. Compared to April 2019 these individuals will be $1.76 per month poorer once again a full year later. Similarly, a single parent with a two-year old will have $1.47 less in April 2020 than he or she had in April 2019. A couple with two children will be $3.44 further in the red. Only a single person with disabilities, the group that receives a 5% raise, will actually gain, by the sum of $22.54 per month, after correcting for inflation. Recently published budget documentation shows that over the last fiscal year Community Services spent $2.5 million less on the ESIA program than it thought it would. The department has an overall budget of $995 million, including an ESIA budget of $348 million. In that context the ESIA surplus may not seem that big a deal. But the news may be difficult to stomach for people on welfare who struggle to make ends meet, and are now finding out that the long-ago announced raise in benefits was mostly hot air. See Vince Calderhead’s detailed calculations here. tHIS NEEDS TO CHANGE AND now,you make BIG MONEY,why don’t you try to live on this for 6 months and then tell all of us how you made out.I f there is a surplus,give more and stop taking away.Who the hell do you think you are.I pay my taxes and way to much.I am a Senior and I do not get enough but those people have nothing.They live on less then a $1000.00 dollars a month and you keep taking more money from them.That is why we have so many people on the streets because they can not find housing on that little amountMost of these people have worked and fell in hard times and now you are forcing them to live with nothing and are now homeless.MAYBE ALL OF YOU SHOULD TRY IT.SEE HOW YOU LIKE IT.No you make big money so you take from the poor and give to the rich like yourself. Single with a disability in HRM and I get $485 that’s it. For everything! Once a month!